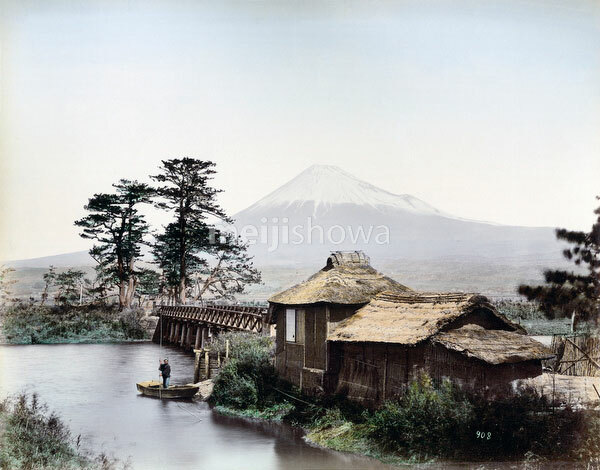 Kawaibashi Bridge (河合橋) spanning the Numakawa River (沼川) near Taganoura (田子の浦) on the Tokaido, ca. 1880s. In the foreground is a building with a thatched roof, next to it is a small wharf where a man is standing in a small wooden boat. In the background Mt. Fuji can be seen. The Numakawa flows from Ukishima Pond towards Tagonoura. Before the bridge was built during the Kanbun Era (1661-1673), people crossed this location by ferry. Across the bridge electricity poles can be seen, indicating that this photo was taken during the 1880s.